The Court of Final Appeal ruled on January 10 that the majority of a group of about 5 000 Mainland people claiming the right of abode did not have the right to live permanently in Hong Kong. On the same day, Mainland authorities announced a grace period for those who had entered or remained illegally in Hong Kong but had lost their case to allow them to return without sanction to the Mainland before March 31, 2002 . A report released by the government's Economic Analysis Division on January 24 found Hong Kong was rated fourth of seven selected cities surveyed on the cost of living for expatriates. The most expensive city was Tokyo, followed by New York and London. Singapore was fifth followed by Shanghai and Taipei. Financial Action Task Force on Money Laundering (FATF) met in Hong Kong from January 30 to February 1 for an FATF Plenary Meeting that was followed by a Special Forum on Terrorist Financing on February 1 attended by representatives from more than 55 jurisdictions. The Financial Secretary, Mr Antony Leung, led the Hong Kong delegation to the annual World Economic Forum (WEF) meetings in New York from January 31 to February 4. It was the first time the influential meetings, held in New York as a mark of respect for the September 11 terrorist attacks, had been held outside the WEF's 'home' in Davos, Switzerland. The Chief Executive, Mr Tung Chee Hwa, was on March 4, 2002, appointed by the Central People's Government to serve a second term from July 1, 2002 to June 30, 2007. Mr Tung was returned uncontested following the close of nominations for the Chief Executive election on February 28, 2002. The Financial Secretary, Mr Antony Leung, delivered his first Budget on March 6, 2002, revealing that Hong Kong's GDP had grown by 0.1% in 2001 and was forecast to grow by 1.0% in 2002. The world's largest free newspaper group, Metro International S A, announced on April 15 that it would establish its Asia Pacific headquarters in Hong Kong after launching its first Asian edition in Hong Kong that day. Metro International S A publishes 23 editions in 15 countries and is a publicly listed company on the NASDAQ and Stockholm stock exchange. The Chief Executive, Mr Tung Chee Hwa, on April 17 unveiled details of a new accountability system for principal officials to improve the accountability of the government and provide a more focused approach to policy formulation and implementation. Hong Kong International Airport was awarded the accolade of world's best airport, for the second year running, by the British air travel industry research company Skytrax Research on May 9, 2002. In July 2000, 'Hong Kong, China' was elected vice-chair of the World Customs Organisation for the first time. Two people died and 48 were injured when Mainland migrants seeking the right of abode in Hong Kong set fire to an office in the Immigration Tower on August 2, 2000. One of those who died was a Senior Immigration Officer, while 25 of the injured were Immigration Department staff. Hong Kong University Vice-Chancellor Cheng Yiu-chung and a Pro-Vice-Chancellor Wong Siu-lun resigned on September 6, 2000, following allegations that they had tried to inhibit the academic freedom of a university academic carrying out public opinion polls on the government. During a public hearing into the matter, both men vigorously denied they had tried to restrict the polling work. More than 1.33 million people took part in the Legislative Council elections on September 10, 2000. 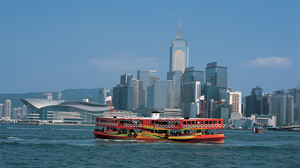 Hong Kong took part in its first Olympic Games as 'Hong Kong, China' at the 2000 Olympics in Sydney in September. The Education Commission announced in September 2000 a blueprint for the development of education in the 21st Century, giving priority to students to enjoy learning, enhance effectiveness in communication and develop creativity and a sense of commitment. In October, Hong Kong was elected President of the Financial Action Task Force on Money Laundering for 2001/2002 in recognition of ongoing efforts by the SAR to combat money laundering. The Mandatory Provident Fund System  a compulsory retirement savings scheme  was launched on December 1, 2000. The system will provide retirement protection for Hong Kong's workforce and help to considerably broaden and deepen Hong Kong's fund industry. The International Monetary Fund established a sub-office in Hong Kong in January 2001 to enhance surveillance and economic developments in the region. Following the retirement of Mrs Anson Chan, the then Financial Secretary Donald Tsang Yam-kuen was on February 15 named as the new Chief Secretary for Administration with effect from May 1, 2001. Executive Councillor and banker Antony Leung Kam-chung was named as the new Financial Secretary with effect from the same date. Hidden Dragon at the 73rd Annual Academy Awards on March 26, 2001. The European Union announced that from April 10, 2001, HKSAR Passport holders would be given visa-free access for visits up to three months. Hong Kong launched its new international brand  a powerful and energetic dragon  at the prestigious FORTUNE Global Forum held in Hong Kong in May. The new brand and brandline 'Asia's world city' would be used to promote Hong Kong internationally in a more consistent and focused manner. In June 2001, hundreds of newspaper and media executives from around the globe gathered in Hong Kong for the World Newspaper Congress.